First thing to do if your home loan application gets rejected is, to relax. Because there are ways to figure out and get it done. Usually, a home loan gets rejected for the following reasons. 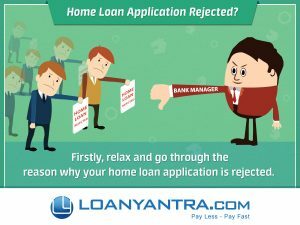 Reasons why a home loan application is rejected. Credit Score : The foremost reason for your home loan application to be rejected is your low credit score. For availing any loan, you should have a good credit score. Any lender, either a bank or an NBFC go further with the loan process after checking the borrowers credit score. So, if the credit score is low, the home loan application gets rejected in the first step. Eligibility Criteria : If the loan amount applied is more than the eligibility, the process might terminate stating you don’t meet the eligibility criteria. The loan is usually sanctioned based on your source of income and the amount of income you get. 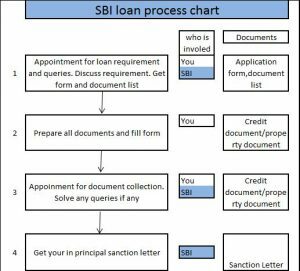 Home loan application gets rejected if the lender feels that you cannot bear the EMI. Valuation Of the Property : The next step is evaluation of the property. Sometimes, even if you are eligible for the applied loan amount, your property might value less than you had applied for. In such cases again, the home loan application gets rejected. Processing Fee Cheque Bounce : You have to pay the processing fees in the form of cheque. If you have no enough amount in your bank account, then the cheque gets bounced. So, if the cheque gets bounced, the agent gets back to you with a rejection message. Other Reasons : If there are any transition changes in your life say you are in between two jobs, or you are turning to be a new entrepreneur from an employee working for a company, or you are working for a small company, or having minimum work experience, all these might lead to a home loan application rejection. Reasons w.r.t People : Sometimes, your co-owner is not the person mentioned in the lenders’ conditions, or you are a co-owner or guarantor to someone else (not a problem if your credit score is good and you reach your eligibility), or you have too many co-borrowers for your property or you have too many independents on you, or you hold a too old property, any of these reasons can reject your home loan application. Home Loan Application Rejected? Here are the solutions. 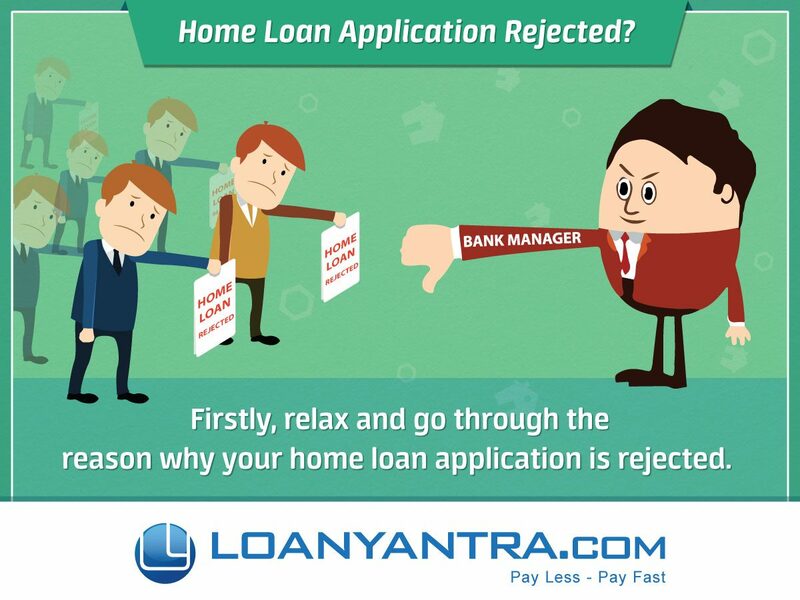 Firstly, relax and go through the reason why your home loan application is rejected. Then act accordingly. In India, it is possible if you apply for a home loan immediately after the rejection, provided you take the required steps and rectify the reason with a proper solution. Hence, let us look into the solutions for the respective problems. Credit Score : Check your credit score before you apply for your home loan. If you have a low credit score, see to it that you get it right by clearing all your pending credit card bills or by paying old debts or by removing your name as a guarantor or co-borrower if you are for anyone. Eligibility Criteria : If this is the reason, then you should look at reducing the loan amount. If you require so much amount for loan, try applying after your increment. Or increase the tenure and reduce the EMI of any existing home loan or personal loans if any as this will increase the income in hand which will ultimately increase your eligibility. Valuation of the Property : Before you buy a house, you should have the valuation details. If the valuation estimate by the lenders is less than what you had estimated, then the loan amount you had asked for will not be sanctioned. This happens only when there is a huge difference between the estimates. But if this is the reason, then you can try with different lenders as each lender’s value has a slight variation. Or if you want the same lender then you apply the loan again by reducing the loan amount. Processing Fees Cheque Bounced : In this case, usually your agent immediately informs you. So, see to it that you start the home loan process or you give a cheque dated in the beginning of the month as it is sure you have enough amount in the account in the beginning of the month than at the end. But see to it this never happens again. Other reasons : For all other reasons, the transitional changes, you have to wait till you meet the lenders’ conditions. Any lender asks for three months pay slip if you have a change of job. If you have a start-up or if you are working for a start-up, the start-up should have good investors or it should be running in profits. If yo need the loan immediately, you ca try with the NBFCs which are a little lenient with the rules. But note that the interest rate is a little higher than the banks. Reasons w.r.t. People : Having more independents is really a serious problem. If you reduce the loan amount, probably there are chances of getting the loan. Firstly, you should figure out if you can really manage your EMIs and run a family with your income. The better option is to wait till your increment and then apply. Though you might go with the NBFCs, you might have a tough time managing. If your home loan application is rejected because of too many co-borrowers, then you can choose two out of all of you who has more eligibility and then apply for the home loan. though legally the home loan is on the two chosen ones, you all of you can share the EMI. Ensure that you are in good terms till the end. The mantra for your loan to be processed is just follow the minimal conditions by the lender as they are lending really huge. Don’t panic. No pain no gain. So, think and take the next step as any more rejection in the application will affect your credit score. Loanyantra.com is always there to help you and suggest you for a doable job. You can take our guidance and get the loan as customised also at lower interest rate. All you have to do is just inquire in our website. We will do the rest. Happy Home Loaning.